Religious differences between Egyptians of the Osirian cult and Asiatics who worshipped Baal and Ashtaroth were not issues of conflict, since they shared common deities. The long dominion of Osiris in alliance with Baal and Ashtaroth before the latter part of the cycle of Cpenta Armij is relected in the co-existence of these deities in these two religions and cultures. Extract: ||Though the kings of the 15th dynasty ruled over the country, the sources suggest that the 16th dynasty ruled as local subordinate authorities in the regional centers of the countryside all over Egypt in the meantime. This authority held more power than a simple mayor. The political construction reminded more to an early feudal society than an absolute monarchy. The Hyksos fully assimilated to the local cultural life. They tolerated the Egyptian religion. Surprisingly the most important religious cult was the one of Seth, who was the god of chaos, infertility, destruction, the deity of the desert and wild storms for the Egyptians. Though he is not fully evil (read more about him in our "Gods" section), by his mythical role - he is the assassin and the self-elected successor of Osiris - he is the opponent of the pharaoh, who is the representation of Osiris. This probably must have been intentional ideological confrontation against the pharaohs who were considered to be the manifestation of Horus in person and the traditional enemies for Seth. This opposition is proven by the name "Apophis" preferred among Hyksos kings which is another trace of the Seth-cult (Apophis is the celestial serpent who tries to prevent the bark of Ra from processing on the Western horizon but Seth defeats it night after night). ||Of all the events that took place in the time of the Asiatic chieftains, the most important was one that did not occur: There was no war of consequence in Egypt throughout the rule of the Semitic chieftains! 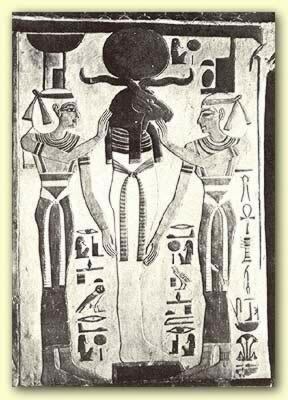 It can be understood from the above that Egyptian law accepted those who accepted Osiris as supreme God, allowing them to have ruling positions subordinate to the Pharaoh. This helps to explain the absorption of such Asiatics as accepted Egyptian Religion into the ruling classes of Egypt. Egypt had long been a nexus between Nubia in the south and Asia in the North East, the criteria of what was Egyptian had more to do with culture and religion than a particular ethnic group, since Egypt’s existence sprung from, and continued to develop, via a mixture of people and cultures. Foreign subsidiary rulers to Egypt are further referred to in Oahspe in relation to Moses who was the Pharaoh’s ambassador for 12 years, prior to 1550 b.c.e. Contrary to being subservient to foreign rule, Egyptian hegemony was dominant even though there was the constant fear of subordinate regions attempting to overthrow the Egyptian yoke. beyond Egypt as tributary kingdoms, which paid taxes to Pharaoh. and Egyptians who worshipped these deities, that there was an accepted co existence between them. lower heaven and earthly dominions of Baal during the cycle of Lika. brother Re and Osiris occupy the same heavenly abode.